You are here: Home » Admission Tips » Two Letters or Three? Differences between the MBA and the MS.
Two Letters or Three? 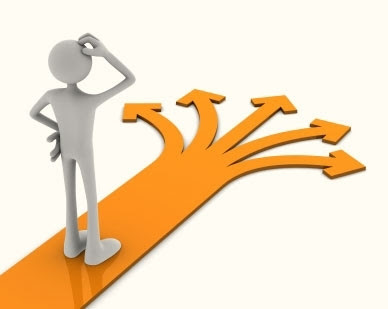 Differences between the MBA and the MS.
Making tough decisions...MBA or MS? As many students make the career-altering decision to either continue with or return to school for a master’s degree, many encounter a crossroads determining the best degree option for their goals. This becomes particularly relevant as a prospective student evaluates the Master’s in Business Administration against the Master’s of Science (whether in Finance, Accounting, Marketing, General Management or another field). There are many strengths and similarities between both degrees, but there are also differences to consider including the time required for the degrees, the content itself and the projected career path. In the next few bullet points, I will provide some points of difference between both programs to help you better understand and classify which program you may have an interest in pursuing. *Difference One: The time required to complete each program. The MS programs we offer here at Simon require only one year of full-time study to complete the degree in its entirety. The full-time MBA takes two academic years to complete, with students occasionally finishing in a year and a half (either because they start in January or as a result of graduating early). This means those with the MBA typically pursue MBA-level internships between the first and second year, while those in the MS programs are pursuing an internship that would lead to full-time hire or a full-time position on its own at the conclusion of the program. An additional point to consider when evaluating a projected start date is that our MS programs begin before our MBA program. Our MS programs begin orientation and programming in late July or very early August well before the start date for our fall MBA program, which begins in September each year. The purpose of the MBA itself is to provide the candidate with a generalized business education. This includes an understanding of a variety of subjects that shape a future manager’s ability to successfully manage either her own enterprise or serve in a managerial role in another company. Topics ranging from business communications, accounting, marketing and operations are shared with elective material that can be taken on a one-by-one basis, or toward one or more concentrations. The concentrations at Simon are similar to undergraduate college majors. When one is pursuing the Master’s of Science, the academic coursework is more concentrated in the specific field that one is pursuing for the overall degree. Students in the Master’s of Finance program will take mostly finance coursework, Master’s of Marketing will take mostly marketing coursework, the Master’s of Accounting will take mostly accounting or the relevant finance coursework, et cetera. However, many classes taken for the MS programs are also taken by MBA students. It is this, in part, that allows graduated MS students to apply their coursework for credit directly to the MBA if they choose to pursue that additional degree here at Simon. The program that you select will also affect the type of positions you will target for full-time employment post-graduation. Pursuing internship and entry level positions that require more in-depth industry knowledge are most suited for those who have gone directly from their undergraduate study to the MS programs. Those who have previous full-time work experience in a particular industry and pursue the MS degree to deepen their knowledge base often pursue mid-level roles. Some students pursue the MS degree as a starting point for their business education also with the knowledge that they will return for the MBA at a later time when they have gained additional work experience. For individuals pursuing the MBA it is used as a tool to assist with a career change, or to jump start a position in the mid-management level of a targeted company. Many students seek employment from the company that sponsored their summer internship, or use that experience as leverage within their targeted industry. Applicants should be well-informed when applying to a particular program. At Simon, we only allow students to apply to one program at a time; you cannot submit two applications with the hope to get into one program or another. Additional resources (brochures, statistics, and current student and alumni profiles) help to compare and contrast further if you require more insight. Regardless of the program you ultimately apply (and hopefully) are admitted to, an education from the Simon School at the University of Rochester will be one of the best decisions you can make for your career. I recently interviewed and I believe the admissions team does a great job trying to assess your current skill set and background with the program best suited for you. As you have the conversation about going back to school and pursuing future goals, it helps to know that the school won’t tell you what you want to hear, but will give you the most realistic picture as to whether or not obtaining this degree will set you up for optimal success, given your previous history. With that said, course content is very important as you compare and contrast Univ of Rochester with other schools, be sure to read the course descriptions, some courses are unique to certain programs and the opportunity to take those courses creates added value. I don’t know what my outcome will be, but I wish everyone the best of luck as we pursue our goals and keep in mind there are multiple routes we can all take and still end up on the same path.